DROP DEAD GORGEOUS MASTERPIECE W/TOP OF THE WORLD VIEWS! PANORAMIC VIEWS TO OCEAN & SD COASTLINE.This newly built, stunning showplace is the LOOK & THE DREAM you've been waiting for! END OF CUL-DE-SAC location!Tons of beautiful upgrades throughout! Private 2 room casita with separate entrance AND full bdrm suite downstairs. SOLAR! The entertainers dream kitchen boasts an oversized island w/high end quartz, custom backsplash, SS appliances & more! 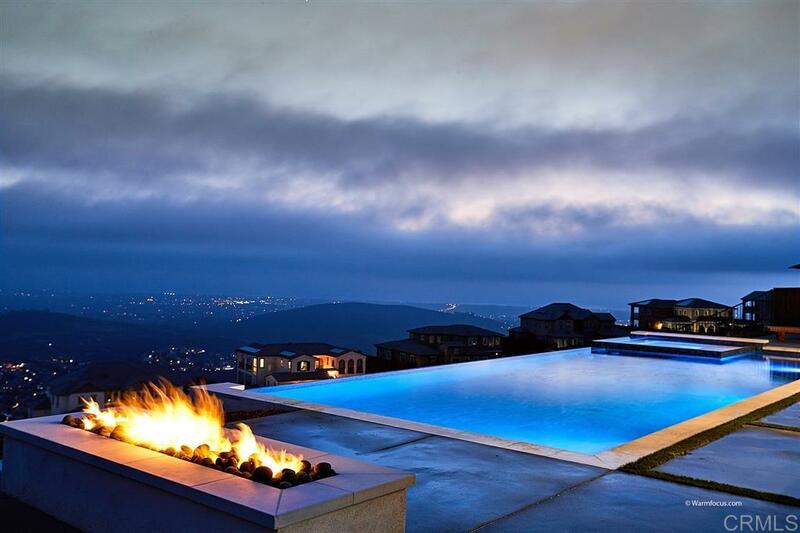 Infinity pool, spa, Baja shelf & fire pit. See supplement, WELCOME TO 1109 JASPER CT located in the prestigious, gated community of Crown Point/The Summit. Step inside this breathtaking showpiece to a wide open floor plan w/custom paint, luxury flooring, modern fireplace surrounded in quartz! Open the stackable sliding doors off family room which lead to the outdoor living area w/fireplace. The private 2 room casita, with separate entrance features a kitchenette & laundry (perfect for nanny or in-laws). There is also a full bedroom suite on the first floor. Upstairs has plenty of living space with huge loft & 2 other secondary bedrooms & baths. The amazing master features a retreat area, & large view balcony....the perfect place to unwind at the end of the day. The lavish master bath offers a family size shower, freestanding tub, and marble flooring & massive closet. Fun custom play closet for kids downstairs! New landscape/hardscape in front & back . Enjoy views from every angle in the backyard, which features large outdoor seating area w/ firepit, large side yard w/turf. You will enjoy swimming in the sparkling, infinity pool w/ jacuzzi. Other features include custom lighting, dual zone AC, Kevo lock system, Ring system, and more! Convenient to shopping, entertainment, and easy drive to North County's best beaches! All in a Top Rated School District! See this dream home & fall in LOVE!